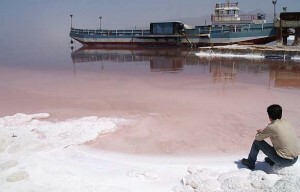 Oyannews: Water and environment experts have warned of significant health risks if Lake Urmia in northwestern Iran dries up. The lake was once the sixth largest salt water body in the world, and the largest lake in the Middle East. But the lake has shrunk in recent years due to bad management, including the development of a causeway and badly designed and executed dams and wells, both of which had an enormous impact on water flow. Despite some government measures to improve the situation, Shahrvand newspaper reported that a “shadow” still hangs over the lake and the surrounding area, with experts predicting the lake will be completely desiccated in a matter of years. Though health officials have established links between diseases and the deterioration of the lake’s ecosystem, this new warning suggests an even greater threat to public health than previously thought. In particular, the rise in frequency of salt storms poses considerable risks, including respiratory diseases.